Porch Outfitters offers sunrooms from the industry-leading manufacturer TEMO. Having one of these enclosures installed effectively expands the usable space in your home, as it provides a fully-enclosed and climate-controlled space that you can use for everything from a home office to a place to host get-togethers. However, it also has premium glass wall systems that flood the space with natural light and provide beautiful views. Having a sunroom is like bringing the outdoors in. If you’d like an enclosed patio that provides some shade against the harsh sun and protects you from insects, but still allows you to enjoy a nice breeze, then a screen room is perfect for you. Porch Outfitters custom builds screen enclosures using only the finest quality materials, including premium, vinyl-coated screens, to ensure long-lasting performance. At Porch Outfitters, we’re outdoor living specialists with our own team of highly trained installers – not subcontractors. We ensure every project is completed to our high standards for quality workmanship, and even provide a lifetime installation warranty. 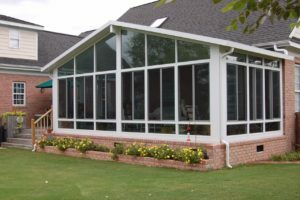 Contact us today to learn more about the benefits of choosing us to install an enclosed patio at your home in Pooler, GA.